The following letter was found in some old things that used to belong to my Great Grandma. It was addressed to Aunt Anderton or Sarah Ellen Anderton (nee Spencer) who lived in Courtenay, Canterbury, New Zealand. It was sent by a nephew that she never met as he was born after she left for New Zealand on the ship Metropolis. Sarah had sent news to England of the death of her husband Tom Anderton who passed away on 08-09-1896. She sent funeral cards to be passed out to family and friends and also some photos of Thomas Anderton (Tom). Our family doesn't have a confirmed photo of Thomas although he is probably somewhere in our photo collection. The letter also shows how unreliable the mail was in those days, getting lost at sea on the 3 months journey from England to New Zealand and vice versa. If you are related to this family, the Andertons or the Parkers, please let me know as I would love to hear more about them. 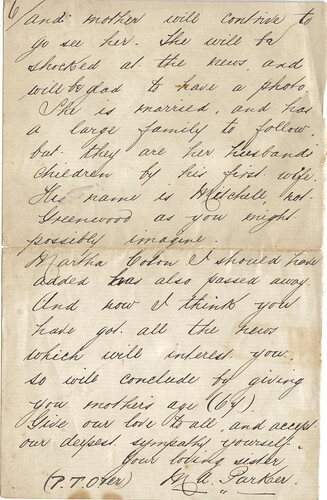 We received your letter dated July 15th and were much shocked to learn of Uncle Tom's death. I am very sorry I have neglected answering your letter until now, but being situated in Leeds mother has had to go over to Halifax to seek up your old firneds and relations, consequently I have delayed writing until she has sought them up. And now perhaps I had better make myself known to you, seeing that I had not come into existance when you left this country. It is rather amusing to have to give particulars of ones existance but I need only state that my name is Albert Edward Parker, only son of Mary Ann Parker (formerly Anderton) and was born in 1871. You will be astonished to learn from the enclosed card that father is dead. He was only ill a very short time, in fact he was only about a week down. I can assure you we were all astounded when the specialist we called in told us he could not possibly live as he was suffering from cancer on the stomach and in such a critical place that an operation was quite out of the question. So we were obliged to resign ourselves for the worst, but it certainly seemed very hard espeically for mother. However father's loss brought about an entire change. I had to take a house in Leeds in which city I was working and mother had to leave the old corner at Hanson lane and come live with me. I am glad to say we are both very comfortable and keep fairly well. Of course . . .
. . . I have not a big salary as yet, but I manage to pay the rent and allow mother a small amount for housekeeping purposes. You will understand her feelings, not having father's money coming in week by week. But we need not complain, ours is not a very bad case compared with some. You speak of the long silence which you have just broken between us, but which I have twice tried to break and have written to you on two occasions by father's request. Did you receive the letters and neglect to reply or have they mis-carried. We thought it very strange never to hear from you in reply in fact father concluded that you were both dead. However be good enough to answer this letter and please don't keep us long in suspense. Mother's sister Aunt Martha and Aunt Jane are both living. Aunt M still in Taylor ? Crossley Terrace. Aunt Jane after losing her husband went to Blackpool, where she is keeping a boarding house along with her daughter Sara Anne. My sisters you will know, Sarah Jane, Annie and Lavinia, but I was a later edition. Sarah Jane is married and living at Ovenden just outside Hx. Her husband is a . . .
... chemist and they have a family of five. Anne is in America and Lavinia at her husband's native place in Somesetshire. We shall be pleased to receive the photos you mention and mother will dispose of the funeral cards as she comes across your old friends, but many of them seem to have departed this life. We have often expected to hear from Hannah and Charley. Give our love to them. Among your particular friends who have passed away are Wm Eastburn, Wm Sladdin, Ben and Liza Schofield and Hannah Greenwood. Mary Coton lives at Bradford and mother will contrive to go see her. She will be shocked at the news and will be glad to have a photo. She is married and has a large family to follow but they are her husbands' children by his first wife. The name is Mitchell, not Greenwood as you might possibly imagine. Martha Coton I should have added has also passed away. And now I think you have got all the news which will interest you. So will conclude by giving you mother's age (67). Give our love to all and accept our deepest sympathy yourself. We were please to note that Uncle Tom left all to you and trust you will thereby be comfortably provided for.